Wine, today, is not simply a beverage but it is linked with religion, cooking, feasting, and our forms of social gatherings. The history of wine also shows it has long been associated with human societies since the early development of agriculture and early domestication of grapes at about 8,000 years ago in the Near East. Since then, wine has become spread on all major continents human societies have spread to. Wild grapes Vitis vinifera are found in the eastern Mediterranean regions, stretching from Turkey, the southern Caucasus, and northern Iran. The earliest known grape wine production is found in northern Iran, the site of Hajji Faruz, a site that dates between 6000-5500 BCE (Figure 1). From evidence, it seems this early wine used terebinth as a form of preservative, similar to Greek wine Retsina that is still drunk today. This would suggest that Retsina wine is the oldest known wine type or method production. The wine itself was evident through residue of tartaric acid, a substance commonly found in grape wine. Both white and red wines were likely developed at about the same time, as the main difference is in fermenting with (red wine) or without (white wine) the grape skins. Figure 1. Places where grape wine has been located from the Neolithic to the Bronze Age. In China, residue of rice-based wine, perhaps even earlier than wine found in the Near East, has been found. However, other possibilities, rather than a fermented drink, cannot be ruled out. Wine may have been produced not only with rice but also mixing of fruits as well to add flavor. Tartaric acid was found in clay jars, suggesting fermentation and mixture of substances. While rice wine may have developed early on, it stayed mostly in east Asia. Rice wine spread by the 1st millennium BCE to India, Japan, Southeast Asia, and the Korean Peninsula, where it is still commonly drunk today. In Africa and tropical regions of Malaysia, India, and Southeast Asia, types of palm wine have been produced and are still consumed. It is not clear how old this tradition is but it does likely go back to ancient periods; European travels had observed how the wine was made and harvested in early contact periods. Palm wine can be made by collecting date palm sap and letting it ferment, where it can then be filtered to remove impurities. Already in its early development, wine became associated with ritual consumption based on the context of some archaeological finds. This includes being used for libations to gods and the dead; ritual drinking of wine represented commemoration of the gods and the dead. Very likely, the alcoholic properties also gave it a mystical aspect, suggesting why it was associated with the gods. Health benefits were also likely realized, where the alcohol was known to kill harmful substances. By the 4th millennium BCE, wine from some regions began to be seen as being of high quality and sought after. The prehistoric Egyptian king Scorpion saw wine as something to be taken to the next world, where his tomb was found to contain about 700 jars filled with wine from the Levant (Israel and Lebanon). Pips from wild grape varieties have been found in Greece about 12,000 years ago. However, domesticated grapes and wine making arrived by 4000 BCE. By this time, platforms for crushing grapes have been found; at first, wine was probably a household activity, but by the Bronze and Iron Age it became more industrial in scale. Wine from Byblos and other Phoenician cities in the eastern coast of the Mediterranean began to spread widely by the 3rd millennium BCE, traded across the region. Wine made from domesticated grapes began to spread throughout the Mediterranean most likely due to Phoenician traders. Wine now became spread to North Africa and Southern Europe (e.g., see Figure 1). With the spread of wine, other regions began to be associated with better quality wine. Armenia, in particular, began to be associated with high quality wine, where gifts of wine from Armenia were well known and given in diplomatic acts between states. In the Achaemenid period, in the 5th century BCE, gifts of wine were shown to be given to the Persian king on reliefs. To help spread wine, not only did seafaring have to develop so that it could more easily reach distant regions, but preservation techniques were needed. Wine can easily turn to vinegar if not properly sealed. The Phoenicians used olive oil to seal containers so that it could be more easily transported across the Mediterranean as their ships were dispatched. Eventually, grapes were also brought and regions along southern Europe became good growing areas for grapes after sevearl generations of growing. In the Roman period, wine began to spread to more northerly regions in Gaul (France), Germany, and even Britain. Greek colonists had already brought wine to parts of Europe by the 600s BCE. However, the spread of wine by the Roman period helped establish the foundations to a variety of wine types that were adapted to different climates and also create a taste for wine that lasted long after the Roman period. Some climates, such as in Britain, were more difficult for growing grapes, but the importation of wine became more common, acculturating the population to wine consumption. Greek wine became well known in this period for its quality, while wine from Italy was considered more common and average wine for the masses. Wine types known to us, such as chardonnay. may have derived by crossing grapes Gouais blanc with Pinot noir grapes found in France during this time. Figure 2. 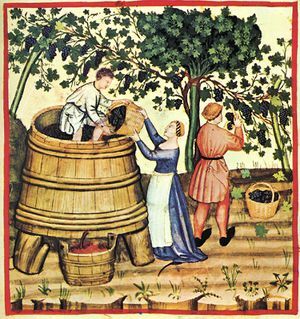 14th century wine pressing. After the Roman collapse in Europe, very like the culture of wine would have died as well. However, the now spiritual connection of wine with religious sacraments, along with local populations having become accustomed to this Mediterranean product during the Roman period, kept its relevance even in regions where it did not grow well. Thus, as Christianity spread, so did wine. Northern Europe became more of a beer and ale drinking culture, due to the climate being more favorable to wheat and barley based alcoholic drinks. However, the need wine for in mass resulted in the constant need to import wine. This also created an important business opportunity for a variety of monastic orders, as the needs of the church created a constant and strong market. Thus, perhaps not surprisingly, the best and most prolific wine producers in the early Medieval period were different orders of monasteries, where many of these continue to make wine today. The Benedictines, in particular, became well known wine makers, often exporting their produce to raise funds in addition to being used for sacraments. Virtual monopolies were established throughout Europe by monastic orders on wine production and trade. After centuries of growing grapes in different parts of Europe, varieties began to form that had become some of the best known wine types today. Riesling, for instance, was a white grape variety that grew well in the Rhine Valley, which has developed their since the 15th century. Burgundy, with its favorable climate and soil for many types of grapes, in France became well known for many wine types, including developing Pino Gris, Pinot noir, and chablis and others that had begun to develop already by the Roman period. Chenin blanc was another white grape variety developed in Anjou (Figure 2). In the New World, Vitis (or grape family) vines did grow, but they do not seem to have been utilized from making wine by prehistoric cultures. Although various alcoholic drinks were known to native populations in the New World, it was the Spanish that brought grape wine types from Europe to the New World. The Portuguese also spread grape wine to Brazil. As shipping was still relatively poor in preserving wine quality, early Spanish explorers and settlers soon preferred to grow wine rather than import it from Europe. With wine production moving to the New World, many experiments began to make wine more adept in growing in more extreme climates found in the New World. British explorers to Australia and New Zealand also brought different grapes and since the late 18th century the wine culture in Australia and later New Zealand, although initially failing, began to be come very successful in the 19th century. Types of shiraz wine, in particular, grew well in those regions. In New Zealand, Syrah and Pinot noir grapes were also among the initial successful wines that grew in the climate. In the United States, the oldest continuous winery is found in New York state, which was founded by a French Huguenot settlers in 1810. Wine spread to cold regions of Canada, where specialized ice wine became developed that took advantage of short growing seasons; this type of wine developed into a very sweet wine. By 1811, settlers in Hawaii even began to grow wine in tropical conditions. More recently in the 20th century, prohibition in the United States and other temperance movements threatened the culture of wine in different countries. However, as wine production has improved with new bottling technologies, and new types of grapes adapted to different climates developed, wine production has not ceased to expand. Although many cultures have had their own indigenous wines, such as made from rice or palm, grape wine has become the far more dominant type because grapes are more easily adapted to a wide variety of regions and its close association with European colonization. Christianity helped to spread wine across Europe and other regions, due to its role in the religious sacraments. Today, there are probably more than 10,000 varieties of grapes that can be used for wine, demonstrating the long history of experimentation with grapes that began as early as the Neolithic. 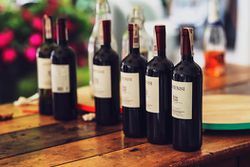 The social association of wine with so many different activities, ranging from religion to healing and social gatherings, has established as central to many different cultures. ↑ For more on the Neolithic innovation of wine production, see: McGovern, Patrick E. 2007. Ancient Wine: The Search for the Origins of Viniculture. 4. print., 1. paperback print. Princeton: Princeton Univ. Press. ↑ For more on rice and palm wine, see: Cyrus Redding, Redding. 2008. History and Description of Modern Wines. Place of publication not identified: Applewood Books. ↑ For more on early exports of wine and its use in ritual, see: Charters, Stephen. 2006. Wine and Society: The Social and Cultural Context of a Drink. Amsterdam ; Boston: Elsevier/Butterworth-Heinemann. ↑ For more on how the Phoenicians helped spread wine, see: Hames, Gina. 2012. Alcohol in World History. Routledge: London, pg. 24. ↑ For more on how early wine was preserved, see: Jackson, Ron S. 2014. Wine Science: Principles, Practice, Perception. Fourth edition. Amsterdam: Academic Press, an imprint of Elsevier, pg. 615. ↑ For more on how wine spread in the Classical period, see: Estreicher, Stefan K. 2006. Wine: From Neolithic Times to the 21st Century. New York: Algora Pub. ↑ For more on monastic wines, see: Simon, Joanna. 2001. Wine: An Introduction. 1st American ed. New York: DK Pub, pg. 18. ↑ For more on types of wines and their history, see: Singh, Dueep. 2013. The Miracle of Wine History, Making, Selling, Preserving, Enjoying. 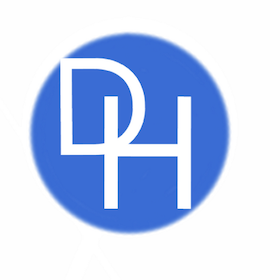 JD-BZ Publishing. ↑ Fore more on the spread of wine to the New World and other regions, see: Unwin, P. T. H. 1996. Wine and the Vine: An Historical Geography of Viticulture and the Wine Trade. London; New York: Routledge, pg. 204. ↑ For more on the history of wine growing in the United States, see: Pinney, Thomas. 2007. A History of Wine in America: From the Beginnings to Prohibition. Berkeley, Calif.: Univ. of California Press. ↑ For more on wine varieties today, see: Robinson, Jancis, Julia Harding, and Jose Vouillamoz. 2012. Wine Grapes: A Complete Guide to 1,368 Vine Varieties, Including Their Origins and Flavours. 1st U.S. ed. New York: Ecco.